Survival kits contained day/night hand-held combination flares and smoke signals. 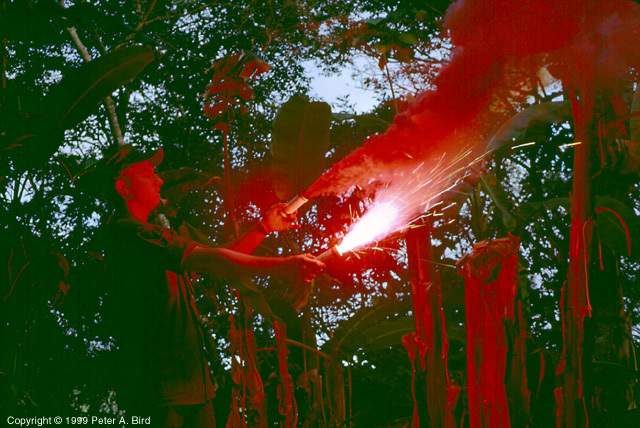 At night, you used the brilliant red flare and during the day you used the bright orange smoke. If you were deep enough in the jungle, however, the orange smoke would not rise above the top of the tree canopy. In order to encourage it to rise more readily, the technique shown above was used. Both a smoke signal and a flare were lit off and the heat from the flare was used to develop a rising column of air which would carry the smoke up.